WHEN TWINNKLEBEAR SAW IT: Fuzzy image, clearer recollections. She had cancer of the uterus, that required surgery. That surgery, was scheduled for (and I shall write it the Yank way here!) September 25, 2017, with a wonderful and skilled surgeon who we found. Things were coming to a head. Ironically, the anxiety noise coming to a crescendo, was a relief because we finally knew. It was a relief because knowing the truth, pointed to a solution, and that solution culminated in the life-saving surgery that Twinklebear had on September 25, 2017. Thank God! “I’ve had this recurring dream since I was about 14 years old. There were some years I had it more frequently, but I had it at least twice a year, every year. In the dream, a really ancient Chinese man–he must have been centuries old in my dream–took me, kidnapped me from you, and imprisoned me in an underground type of place, beneath a Chinese restaurant. It wasn’t like a basement, but more like an “underworld,” if you know what I mean. This ancient man took me because he liked my light colored eyes—they were green in my dream. He imprisoned me in a glass casket in this underground, although I was alive. The ancient man took me away from my lover, an Asian man who wore all black. I didn’t realize until I met you in 2015, that this man was you. His face was yours! In my dream, I now recognize his face, as having been yours. Anyway, this man who took me, was of a different tribe than you and me, if that makes sense. In my dream, you wanted to get me back, to rescue me. You somehow got into this underground, and killed my captor, and then took me outside. The details of my dream were always the same, but I now recognize you, Sookybear, as my lover in my dreams! He always wore black in my dream, just like you always wear black–and his face in all my dreams, was your face! You took me outside into the sunshine, and I looked all around, bewildered. During our reminiscing about the dream, we experienced several true “Oh my God!” twin flame moments, when Twinklebear had some latent memories surface about the recurrent dreams, that she had not remembered before. It seems that talking about spiritual events with deep introspection, sparks heretofore hidden memories. Introspection becomes “retrospection” in the process. To begin with, Twinklebear recalled that for the last three or four years prior to our meeting in 2015 before the dreams ceased completely upon our meeting—the dreams evolved into “companion dreams”—that dovetailed with and were related to the original recurrent dreams. When Twinklebear was conveying to me how the recurrent dreams were changing and morphing into some sort of “companion dreams” to the original dreams, she said to me…. 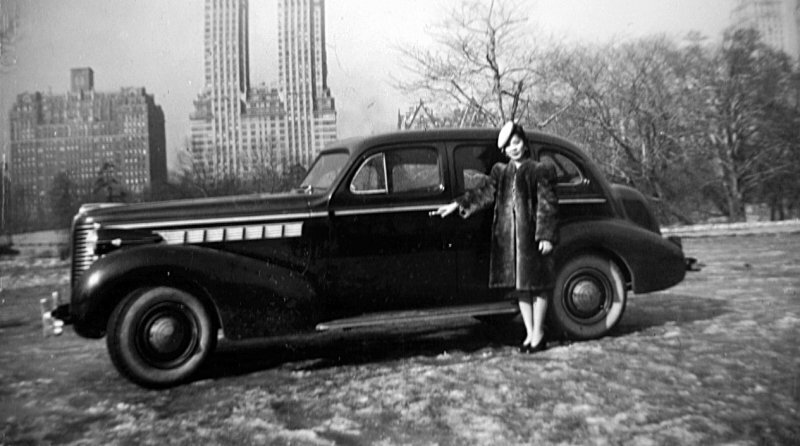 Twinklebear realized the woman in the dreams was my mother, pictured here in NYC’s Central Park in 1938. When Twinklebear described my mother’s demeanor, she was accurate to a “t.” My mother was at times, a difficult and brusque person, when she wasn’t being kindly. It should be pointed out that my mother had a laundry, but Twinklebear knew nothing about the physical layout of my mother’s laundry, or the streets and landmarks surrounding it. I then showed Twinklebear the picture on the top of this memoir of my mother’s laundry. When Twinklebear saw the picture, she said…. I was bowled over! She described details regarding my family’s house with the laundry at ground level (my parents owned the building, and our home was the 2nd floor flat while we rented out the 3rd floor flat) that she could not have known, for I never divulged these details to her. She was right about the large grassy area, that was right next to our building when I was a kid. When I was a kid, this was an empty lot with grass, trees and other foliage. It was like a slice of the country next to my house. It was such wild patch of country, that I used to hunt for black widow spiders there. It later became a Carvel ice cream place, before becoming a KFC. This latter was accurate in her seeing, “…a fast food place of some kind.” Twinklebear was actually seeing the same location in different eras (the foliage filled lot that later became fast food places), with visionary accuracy! Twinklebear was describing the gas (petrol) station across the street with its garage and service bays when she mentioned the “garage.” Again, there was no way she could have known about that gas station garage across the street, because I never told her about it. 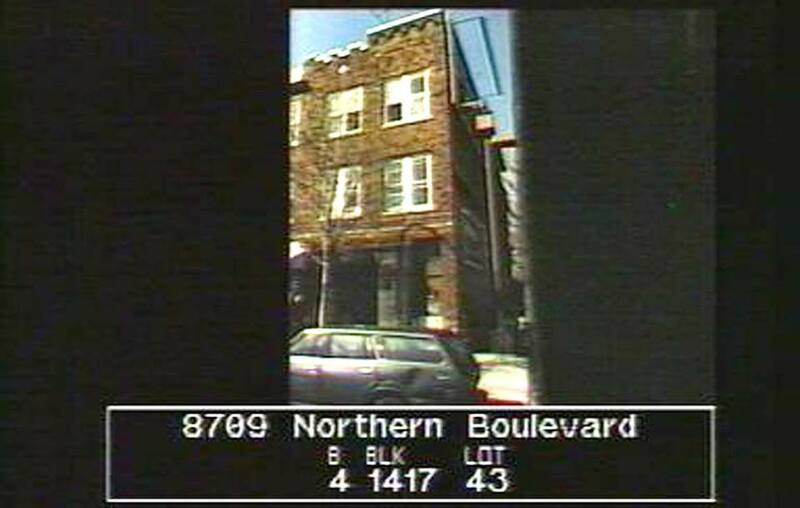 She was also accurate in seeing the streets at the corners of the block, that intersect the “long street” she visualized in front of our building. That “long street” is Northern Boulevard in Queens, New York—which stretches for 73 miles out to Long Island. 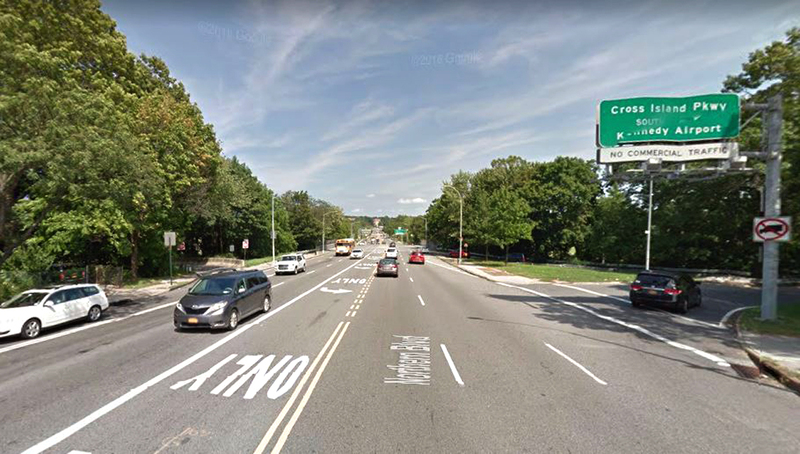 NORTHERN BOULEVARD: The “long street” she saw that stretches out 73 miles to Long Island. Most astonishing was her description of the laundry in her dream…. Uncanny! My parents’ building was a narrow one, as you can see from the picture. The 2nd and 3rd floors consisted of “railroad apartments” (flats) which were a series of rooms arranged like a train, from front to back. Accordingly, the shop at ground level consisted of a series of rooms or “areas” leading to the back—exactly as Twinklebear described it! This amazing conversation sparked a fresh detail about these “companion dreams” that Twinklebear had not recalled before…. When she told me that, I immediately knew what she was seeing. Twinklebear has only seen photos of me teaching or performing martial arts wearing an all black uniform, as I was wearing an all black uniform in the original, earlier recurrent dreams. What she did not know, was that for a number of years while still teaching for my master in his school (before I opened up my own school, I wore black “gi” pants, and white karate “gi” top. Let me explain. As long as I’m “gettiing into the weeds” of fine details in Twinklebear’s prescient dreams, I might as well go all the way. In my master’s school, we taught two styles. One was Jow Ga Kung Fu, and the other was an Okinawan style of karate called Kuen do Ryu. The Jow Ga students wore black pants and a black logo’ed t-shirt. The Kuen Do Ryu students wore an all white karate gi. Because I was proficient in both styles and taught both styles, my teacher allowed me to wear black pants with a white karate gi top, as an compromise and integration of both style’s uniforms—to distinguish me from the students, aside from the black belt I wore. I would have worn all black, except according to traditional etiquette, this is only worn by the master of a school. All of these recovered latent memories, and visions in Twinklebear’s recurrent dreams might seem to be a series of astonishing coincidences. Except that they go well beyond mere coincidence, into the realms of prescient latent memories, predictive dreams and prophetic knowledge that Twinklebear could only have gained through spiritual means. In talking extensively to Twinklebear about it yesterday, it does seem that there was some conflating of one recurrent dream with the other. The human mind is such a tricky mechanism. But discussion between twin flames helped clarify the differences between the two recurrent dreams. On this veritable eve of Twinklebear’s surgery almost a year ago, all of these revelations draw the threads of certainty about us being twin flames closer, forming a more cohesive explanation of who we are. I thank God for this first anniversary coming up, and the amazing recollections about the recurrent dreams and their significance. Northern boulevard, 1938 pic of mom. My mom attended Newtown high School. Love each other, hope your hip is healing up. I imagine you in your place, floating on painkillers, city sounds outside like a distant roar, spending time together. 24 years with Loveflower this go around, 10/12 she goes in for part of a lung removal. Long winter to heal up. Got a feeling it will be a great year for all Goons. Thanks, Mike! Yes, I went to Newtown too. Good luck to your lady, buddy. Such a wonderful memoir my sookybear. Full of spirituality, now, and previous lifetimes. I dream a lot, even now, yet not quite so vividly, as when I dreamt these, also the twin towers and other predictive dreams thank you so much, for putting it all into words. Some details, are sketchy, but it was ages ago, that I dreamt this. The shivers, I felt, when seeing the ” laundry’s window”. Also the street,. Wow! Podmates Twinflames 🐻 pact forever and a day! ❤🐻 12 I love you so much my sookybear.